Accept (1968-1989, 1992-1997, 2009-present) is a Heavy Metal band from Solingen, Germany. omprising of Udo Dirkschneider (vocals), Jan Kommet (guitar), Wolf Hoffman (guitar), Frank Friedrich (drums), Peter Baltes (bass) and characterized by Dirkschneider's high guttural howl and fast drumming they came across as a German Judas Priest. Their beginnings can be traced back to 1968. The band played an important role in the development of speed and thrash metal, being part of the German heavy metal scene, which came to popularity in the early to mid-1980s. Their debut 1979 self-titled album proved to be a promising commercial start. Jorg Fischer, who joined shortly before, left for Judas Priest (he would return briefly in the late 1980s) to be replaced by Frank Herrmann. Breaker (1981) saw another fast-as-hell drummer, Stefan Kaufmann, replace Friedrich before it's recording, an album followed-up with I'm A Rebel in 1980. Both of these next outings obtained them a wider audience across Europe, while the next effort, Restless And Wild (1982), served to highlight their fast pace and influenced the now emerging thrash metal movement. Balls to the Wall (1983) followed along the same lines becoming their most noted album, and broke them in the US market; it also sponsored Hermann Frank on guitar. Balls to the Walls was a more conceptual album than the past works including lyrical themes about politics, sexuality and human relationships (Balls to the Wall referred to slaves revolting against oppressing masters, while Fight It Back was about social misfits fighting against conformity). Kaizoku-Ban, their first live album, arrived in 1985. The follow-up, Metal Heart (1985), was more melodic, and gave Accept their biggest seller and highest charter at 50 in the UK and 94 in the US. Along with with this sudden change, Dirkschneider was fired; soon after would form his own outfit, Udo. Several replacements were tried, including Rob Armitage (ex-Baby Tuckoo) for the recording of Russian Roulette (1986). 1986, however, also saw Jorg Fischer, who had recently returned, leave again. The subsequent follow-up live effort featured David Reese on vocals, while Jim Stacey assumed guitar duties on Eat The Heat (1989). Stacey stepped in for the recording of Eat The Heat after Resse and Baltes got physical on the recent US tour. Shortly after Kaufmann left due to a muscular disease and was replaced with Ken Mary (ex-House Of Lords), but over-all, the band was disappointed with their latest success and called it quits in 1989. It wasn't long before Kaufmann, Hoffman, Baltes and Dirkschneider returned as a unit in time to reform the band for the live effort Staying A Live (1990), Obstruction Overruled (1993) and Death Row (1994). Session drummer Michael Cartellone was featured on their final opus Predator (1996). With 'R.C.A.' out of the picture, a posthumous live set on the metal graveyard label 'C.M.C.' titled The Final Chapter (1998) would close their discography. They called it quits in 1999. 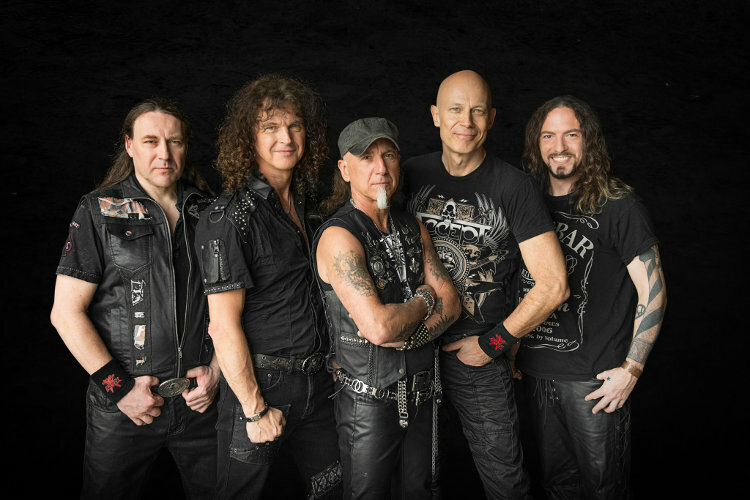 In 2005, Accept received an invitation from European promoters for a short summer European Festival tour with the band's classic line-up of Hoffmann, Baltes, Dirkschneider, Frank and Schwarzmann. These festivals turned out to be a success, with the last show on August 27, 2005. When asked about a permanent reunion, on May 14, 2009, Udo Dirkschneider announced that he would not be participating in an Accept reunion, preferring instead to remain on his own project U.D.O., formerly a side-project that had now become a full time endeavor. Nonetheless, a reunion would happen in 2009 and Blood of the Nations arrived in 2010 with Wolf Hoffmann (guitars/backing vocals), Peter Baltes (bass/backing vocals) and Mark Tornillo (lead vocals). The compilation, Playlist: The Very Best Of Accept (2013), nicely summed up their career so far. Both Uwe Lulis (guitars) replaced Herman Frank in 2014 and Christopher Williams (drums) replaced Stefan Schwarzmann on December 28, 2014. Stalingrad (2012), Blind Rage (2014) and The Rise of Chaos (2017) then resulted.